Which has been cut off I carry as a gift to God." Having affection for Christ, and enduring the flames of fire. Who happens to be known by all as a Martyr. 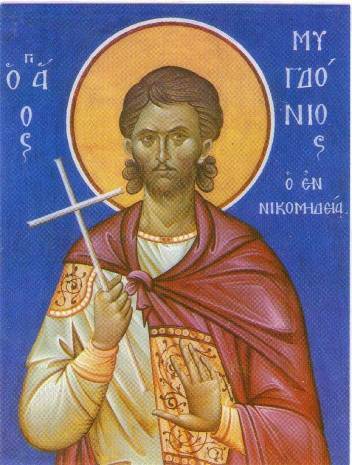 As Emperor Maximian continued dispatching soldiers to apprehend Christians around Nicomedia, there were three pious noblemen who were known to the emperor named Dorotheos, Mardonios and Mygdonios, and they were accused of being Christians. Standing before the emperor, they removed their belts of office and their cloaks, and fearlessly confessed Christ while rebuking the idols. For this the Saints were flogged without pity with raw cowhides all night till the morning. This the Martyrs endured with silence, not uttering a word, but in their minds glorifying God. Then their hands and feet were chained and they were cast into prison. 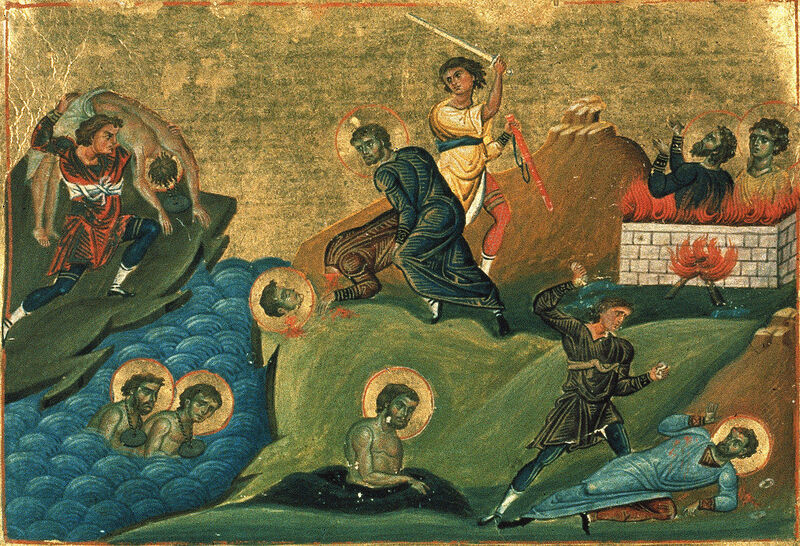 Seeing that they remained steadfast in their faith, Dorotheos was sentenced to be executed by decapitation, Mardonios was to be burned alive, and Mygdonios was to be buried alive in a pit. In this way the triumphant Martyrs finished their course.